A Cambodian HIV patient holds some of her drug regimen in an MSF HIV ward. NEW YORK, MARCH 4, 2013—As closed-door talks for the Trans-Pacific Partnership (TPP) Agreement resume in Singapore this week, international medical humanitarian organization Doctors Without Borders/Médecins Sans Frontières (MSF) calls on the U.S. government to end its stall tactics and revise its proposals for what otherwise promises to be the most harmful trade deal ever for access to medicines in developing countries. The TPP negotiations, which currently involve eleven Asia-Pacific countries, are being conducted in secret, but leaked texts reveal the most aggressive intellectual property (IP) measures ever suggested in a trade deal with developing countries. The U.S. proposals threaten to roll back internationally-agreed public health safeguards and would put in place far-reaching monopoly protections that keep medicine prices high and out of the reach of millions in the Asia-Pacific region. 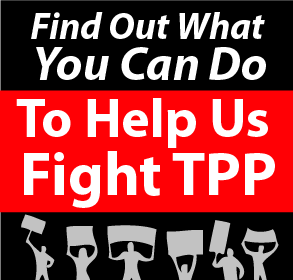 Furthermore, U.S. negotiators have said the TPP will be a template for its future trade agreements across the globe, setting a damaging precedent. Despite widespread opposition to its current proposals, including from other negotiating countries, the U.S. has failed to put forth any alternative text, essentially running out the clock so countries may be forced to accept its original demands in order to meet the announced October 2013 deadline. The proposed IP rules would grant the pharmaceutical industry a wide-ranging set of legal mechanisms designed to prolong monopoly protection for medicines and delay the availability of more affordable generic versions. These demands represent a complete repudiation of the U.S. government’s own 2007 bipartisan trade policy, which promised to scale back some of the harshest IP provisions in trade deals with developing countries. One proposed TPP provision would require governments to grant new 20-year patents for modifications of existing medicines, such as a new forms, uses or methods, even without improvement of therapeutic efficacy for patients. Another provision would make it more expensive and cumbersome to challenge undeserved or invalid patents; and yet another would add additional years to a patent term to compensate for administrative processes. Taken together, these and other provisions will add up to more years of high-priced medicines at the expense of people needing treatment waiting longer for access to affordable generics. Meanwhile, provisions in the proposed investment chapter would give pharmaceutical companies the right to sue governments for instituting any regulation that reduces their expected profits, using private tribunals that circumvent a country’s judicial process. U.S. pharmaceutical company Eli Lilly is using similar provisions in NAFTA to demand $100 million from the Canadian government for invalidating one of its patents, claiming, among other things, that the company’s expected profits were “expropriated” when the patent was overturned.